I did. So I wrote one. And you can now read it. Ever since they gave her a new cyborg body and a steady stream of murderous work, she’s known the rules. Keep your head down, do your job, don’t get involved. Then they sent her to assassinate a child. Instead, she took him out of the City and into the Waste. Of course they’ll be coming for her, and for the strange, quiet, thirsty boy she’s rescued. Because he’s not just a child — he’s a profitable experiment. Bounty hunters. Fellow cyborgs. Cannibals. Monsters. They’re all after him. All she has on her side is an almost-invulnerable body, a lifetime’s worth of stubbornness, and the willingness to kill whoever she has to. It’s going to have to be enough. Now available for Kindle, Nook, Kobo, and in paperback. 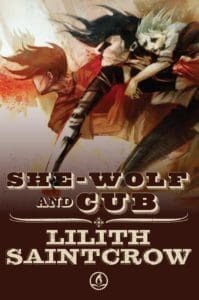 Longtime readers will remember that PACK, an e-short out through Orbit, is one of my first attempts at writing the short story that eventually became She Wolf and Cub. Just in case you wanted to see how a story can change, and morph, and become something COMPLETELY DIFFERENT.